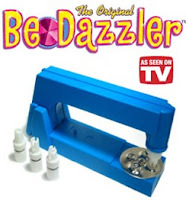 Knotty Lady: The bedazzler is here! Oh glorious day! Tell us, StrugOut, what shall we bedazzle? My new years resolution? All that passes before me shall be bedazzled! First knitting club meeting of 2008 we figure that beautiful contraption out - let the bedazzling begin!